Booking a Maxi Taxi is a no-fuss process. 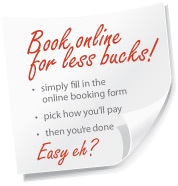 Simply complete our easy online booking form below. The next screen will show how much your trip with us will cost, based on the information you enter below. We’re confident you’ll find this very competitive. Next you add your billing details, after which you’ll be redirected to our bank’s secure online payment form, to enter your credit card details. We never see these details, just whether your transaction is approved or not. Once payment is confirmed you will be redirected to our thank you page, confirming your Maxi Taxi booking, and an email will be automatically sent to you with your journey details and a payment receipt. We will receive your booking details at the same time. We look forward to delivering you the Maxi Taxi experience. What sort of ride do you need? Maxi Taxis is experiencing high loads on Saturday 14th and Sunday 15th March. Please contact our call centre on (09) 309 2000 so we can cater for you accordingly.